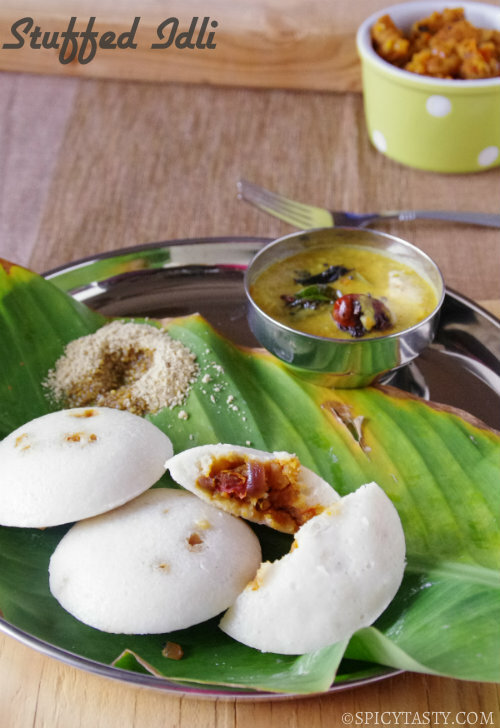 Idli is a staple food in South India. 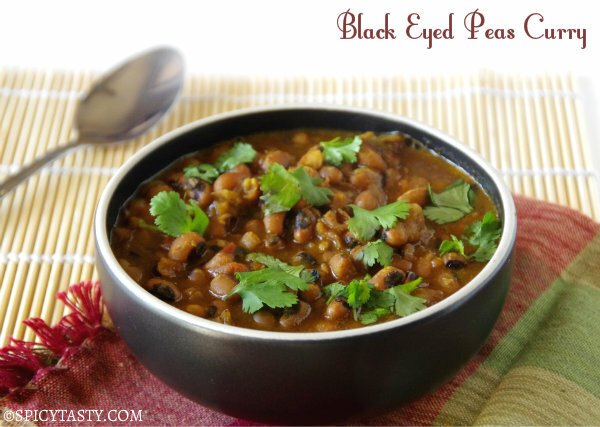 They are prepared from a fermented batter consisting of rice and lentils (urad dal) and served with chutney/sambar. 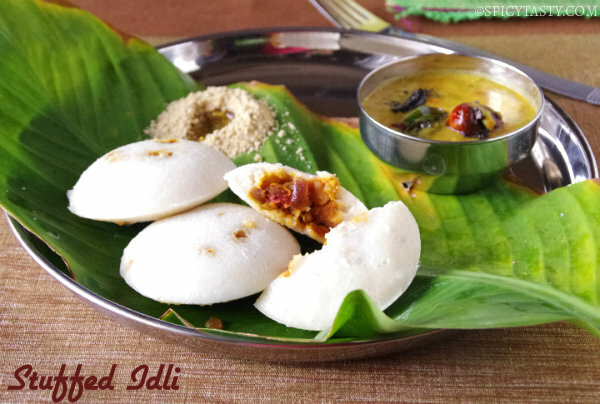 If you are bored of making plain idlis everyday, try this stuffed idlis. They are awesome!! I followed my sister’s recipe from her blog MyKitchenStove.com and made a few changes to the stuffing and it came out so good. My husband (GS) and I loved it. Give this recipe a try and let me know how it turns out!! Heat a tsp oil in a pan and add mustard seeds. When it splutters, add dried chilies and let it turn dark brown in color. Add chopped onions and saute until it becomes translucent. Add curry leaves and tomatoes. Cook until tomatoes are mashed. Add turmeric, chili, coriander and garam masala powders. Cook until the raw smell is gone (about 5 to 10 minutes) over medium heat. Add mashed potatoes and salt, mix everything well. Make a smooth thick curry. 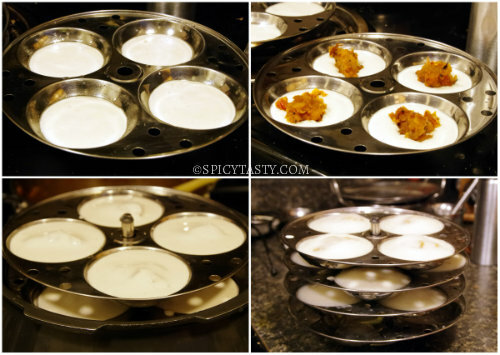 Grease the idli plates with the remaining oil and fill it with idli batter until half full. 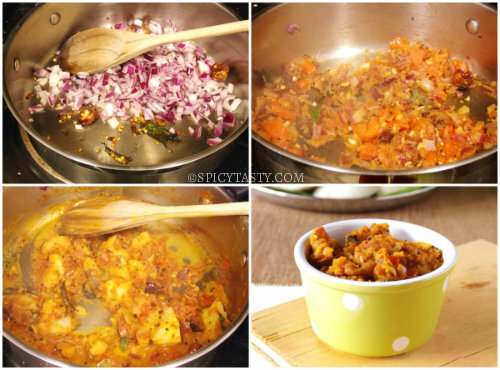 Add a tsp of the prepared masala and then add some more batter on top. 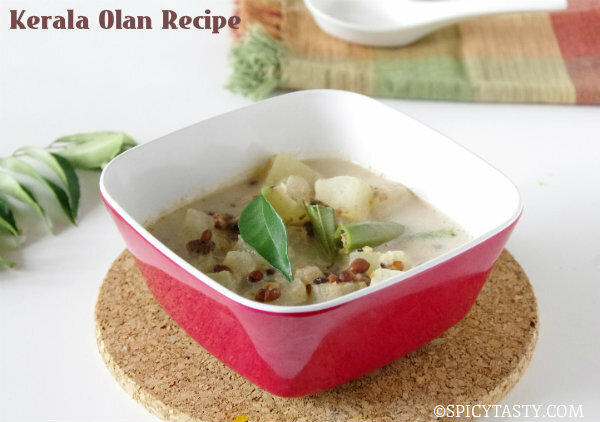 Cook this in a pressure cooker or idli pan for 12 minutes. Stuffed idli is ready. Serve hot with chutney/sambar. Wonderful. I am going to try this. wow!! Yummy11..I had a plan for the Idly..I tried ur receipe..It came out very well..even my 1 yr old son loved it..thank u so much..
Ooo the stuffed version definitely makes it all the more awesome!